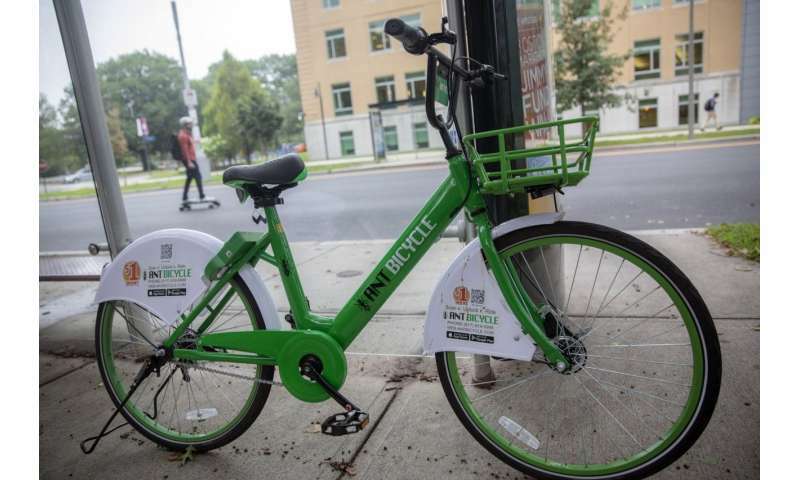 The yellow-and-green bicycles of the California bike-sharing startup LimeBike have popped up in more than a dozen Massachusetts communities in recent weeks, the latest fleet to follow in the tracks of Blue Bikes, which launched as Hubway in 2011. Anne Lusk studies bike environments, including safety and crashes, as a researcher at the Harvard Chan School. She's also a cyclist. 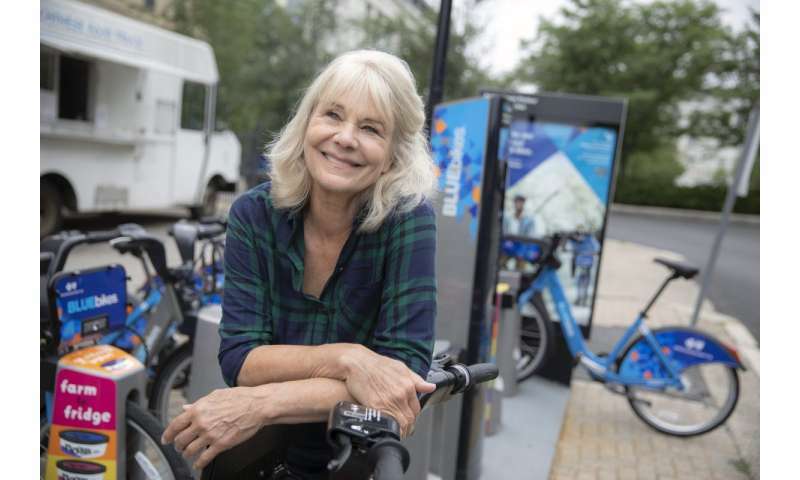 We asked her about the progress of bike-sharing systems. GAZETTE: Some research has found that bike-sharing riders are less prone to collisions with cars than regular cyclists. Is there a safety lesson that can be drawn from that data? LUSK: Research has shown that if a bicyclist appears to be confident on the road—drop handlebars, cleats, no fenders, no wicker basket with flowers and a loaf of French bread—drivers feel they can pass more closely. Bicyclists riding their own bikes are more confident and may take more risks because the route is one they ride often and they are very comfortable in their saddle. Bicyclists on shared bikes may be more timid because they are riding on what is perhaps an unfamiliar route and they are riding a heavier bike that is unfamiliar to them. GAZETTE: How much of a concern is it that shared bikes don't come with helmets? LUSK: The issue of helmets really speaks to the need for a city to create safe bike infrastructure if they also offer docked and dockless bikes. The city could feel that if a person is going to ride a bike-share bike, they should always carry a helmet. That doesn't happen. GAZETTE: Many of these sharing programs also have scooter components, but certain cities have banned them. How do you view dockless electric scooters versus bikes? LUSK: Cities can now have electric scooters and electric bikes along with bike-share bikes, dockless and docked. Cities can ban scooters or electric bikes but as customers demand the scooters and e-bikes, it will be hard for a city to resist. Scooters and e-bikes are more environmental than cars and take up less space. GAZETTE: There have been reports of the ride-hailing boom adding to traffic congestion. How do you see a service like LimeBike fitting into that landscape? LUSK: In Boston and Cambridge, many cars are parallel parked because parking permits are free or only cost $25 and parking in a parking garage is expensive. I perceive that, for each Uber or Lyft, we now have two cars taking up the road right-of-way: a) the car the owner leaves parked on the side of the road near their house because they don't want to lose their space; and b) the Uber or Lyft they ride to their destination that stops in odd places to let out passengers. Every car parked on the side of the road means it is that much more difficult to build cycle tracks and make biking safer. Every Uber or Lyft that oddly parks to let out passengers is a threat to bicyclists. GAZETTE: Residents in some communities have complained about the unattractive look of certain docking stations. Is there a better approach or design that might mitigate those concerns? LUSK: Just as we place amenities to enhance street aesthetics—planters, trees, window boxes, fanciful chalkboard signs, sidewalk tables and chairs, etc.—we should be careful with the placement and design of the bike docks. Bike docks are in place 24/7, even if there aren't bikes in the docks. One way to think of bike docks is to ask a homeowner if they would want to have a bike dock for 12 bikes outside of their house on the sidewalk. If they could design the bike dock, what would it look like to complement their house and their landscaping?